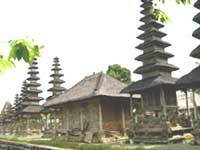 MENGWI: The enormous state temple of Pura Taman Ayun. This temple with beautiful garden surrounded by enormous moat, the most important temple in the Kingdom of Mengwi that survived up to 1891, and this temple was built in 1634 and totally restored in 1937. It is a very big and beautiful place. The first and second areas consist of a wide grass extension while the interior has multitude of altars and Merus. ALAS KEDATON: In here there is forest of the monkeys and the village temple, with an interesting statue of the monkeys, real monkeys, and giant bats hanging on branches of the tree, the monkeys are amusing we can feed them. The seller persons will company you during your visit in here and they make sure that you safe walking among the monkeys. TANAH LOT: from all the temple in Bali, the most popular is Tanah Lot, located in small but spectacular rocky island, well known and photographed place in Bali. It is magnify, so much smoothly illuminated on day light of the sun dawn or profiled at dark. It is very touristy with the group visitors, especially in the sunset time. Mineral drinking water, and entrance ticket, sarong or sash (necessary to enter in certain temples).